The Shelford Channel Transformer Gain Mic Pre-Amp, Inductor EQ & Diode Bridge Compressor from Rupert Neve Designs is the evolution of the original technologies of his classic console modules like the 1073, 1064, 1081 & 2254. The Shelford Channel has been refined for the 21st century studio and can be used as a front-end channel for controlling audio signals in studio applications and more. Featuring a single XLR mic input with 48V phantom, a single XLR line input and XLR outputs, the Shelford Channel is built with a 1/4" line input and a thru connector. Side-chain send and returns, and two link connectors, are also provided. Outstanding features include the inductor EQ section, the tone-packed Diode bridge compressor, the analog power of variable Silk saturation, and a dual-tap transformer output stage with twice the operating voltage of vintage designs that allows the full driving of the Channel without clipping standard converters. With richly-colored tonal options for making bold statements with your music and precisely-engineered detented controls for recall, the vintage-inspired Shelford Channel maintains the soul of Rupert's Neve's classic designs with new levels of versatility. The Shelford Channel's mic input uses direct transformer coupling with 15 dB of gain in the transformer itself; the resulting sonic performance allows the mic pre to capture the more forward mid's and slightly rounded off high and low frequencies of vintage designs like the 1073. 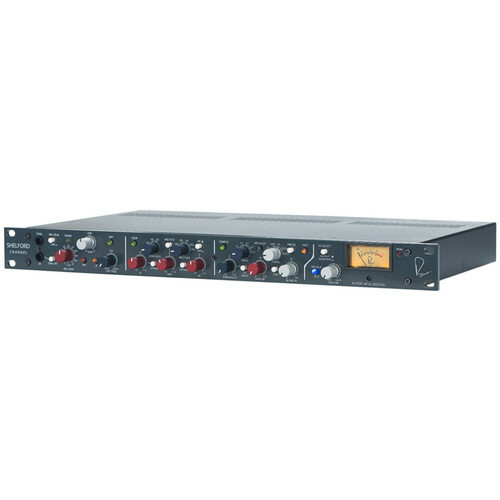 The Hi-Z front panel input uses the same discrete class-A FET with transformer topology as the Rupert Neve Designs RNDI, but it utilizes the new RN4012 input transformer into the microphone preamplifier for gain. It delivers clarity to high-Z sources with a low-end presence and smooth high frequencies. The DI also includes a passive thru output to feed a separate amplifier. The dual-tap output for the Channel's RN2042 square-core output transformer creates both high- and low-headroom outputs without compromising the channel's performance. Designed to capture a pristine sound at high levels while avoiding coloration of the output stage, the high-headroom tap takes full advantage of the Shelford's higher voltage design. The low-headroom tap is optimized to allow an engineer to drive the full-voltage range of the Channel – adding dynamic tone without clipping. The addition of the Silk & Texture circuitry allows control over the harmonic content and saturation of the output transformer. With Silk disengaged, the output is still modern and pristine, yet still retains the larger-than-life transformer sound. When engaged, the 2nd order and 3rd order harmonic content can be dialed up to several times beyond that found on a vintage 1073. It is further controlled with Silk Red and Blue Modes, which emphasizes harmonic content generated by the source's high frequencies. This switch separates the direct connection from audio-signal ground to chassis earth. When green, it indicates "Signal Presence" (a signal level of -20 dBu). When red, it indicates 2-3 dB below input-stage clipping of the Mic/Line stage (+23 dBu while the mic pre actually clips at +25 dBu). This 12-way precision rotary switch controls gain from 0 to 66 dB in 6-dB steps. This rotary switch provides continuous gain adjustment over a range of +/- 6 dB. Provides phantom power on the microphone input. Switches the polarity of the signal path. The HPF switch engages a 12 dB per octave high-pass filter. The HPF potentiometer is variable from 20 Hz to 250 Hz, and can be used to filter out unwanted low frequencies, or in conjunction with the EQ to help shape source material. This control selects the frequency at which the filter begins (-3 dB) to roll off low-frequency signals. It is a 12 dB per octave Bessel filter designed to musically preserve important timing information while cutting low-frequency noise like air conditioning rumble. This switch engages all EQ frequency bands except the HPF. Adjusts up to 15 dB of boost or cut at the selected low frequencies. Cut can be used as a variable, as a gentle alternative to using the HPF. Remember to reduce the signal level at the source to minimize the potential for distortion when any of the 3 bands are boosted significantly. This rotary switch has 4 positions for selecting one of four corner or center frequencies for the low-band EQ section. The frequencies are 35 Hz, 60 Hz, 100 Hz, and 200 Hz. With the LF Peak button pressed the low-frequency band changes to peak mode with a bell shaped boost or cut curve. Between the LF Peak button and LF Freq rotary switch, an engineer has 8-tonal variations of EQ shapes to finesse the bottom end, plus the high-pass filter can be introduced for further tightening and manipulation. When the button is out, the low frequency band operates in shelf mode, boosting or cutting below the corner frequency. The resonance or Q of the mid-band at maximum boost is typically 2 when the button is out. When the MID HI Q is pressed at maximum boost, the Q narrows to approximately 3.5. It widens nicely with less boos or cut as is typical for passive EQ circuits. The Q tends to be slightly wider when the frequency is set lower, and slightly higher for higher frequency selections. The Q is also narrower for cuts than it is for boosts and the mid band is non-symmetrical by design. Adjusts up to 15 dB of boost or cut at the selected mid frequencies. This rotary switch has 6 positions to select the center frequency of the mid-band EQ stage. It utilizes an inductor and capacitors to shape the EQ curve. The frequencies are 200 Hz, 400 Hz, 900 Hz, 1.8 kHz, 3.5 kHz, and 7.5 kHz. When the button is out, the high-frequency band operates in shelf mode, boosting or cutting above the corner frequency at approximately 6 dB/octave. Below the corner frequency the amount of boost or cut gradually diminishes. With the Hi Peak button pressed, the high- frequency band changes to peak mode with a bell-shaped boost or cut curve. With the switch out, the center or corner frequency of the high band is 8 kHz. With the button pressed, the center or corner frequency changes to 16 kHz. Between this switch and the HI Peak switch, you have 4 different EQ curves to finesse the high-frequency content. These pairs of jacks are only used to perform some fine tuning of the compressor operation. The audio that normally controls the compressor is available on the "Sidechain Send" jack. One can take this audio and pass it through an external equalizer then return it back to the "Sidechain Return" jack. The compressor-limiter section is engaged with this button. It can be useful for control of the compressor and it is there for "confidence checks." In particular, exercise it in both the quietest and the loudest sections of the song. Sets level where the compressor begins to react from -25 dB to +20 dB. Minimal or no compression is with this control fully clockwise, and it gets more sensitive and tends to cause more gain reduction as the knob is rotated counter-clockwise. Sets the "slope" of the compression from 1.5:1 (minimal) to 8:1 (significant). It routes the high-pass filter into the circuit that the compressor uses to determine level, commonly referred to as "the side-chain." Often referred to as make-up gain, this is a level control. This six-position control adjusts the attack/release speed of the compressor. Links the side-chain control of multiple units for ganged operation. Adjusts the blend of the dry, uncompressed signal and the compressed signal. When pressed, it alters the speed of both the attack and release of the selected time constant of the compressor. Box Dimensions (LxWxH) 22.7 x 14.5 x 6.8"